Your Time is important, but so are your Saltillo Tiles! Saltillo tile pavers are the most challenging of tiles to deal with, because of their porosity (the tiles are like a sponge). 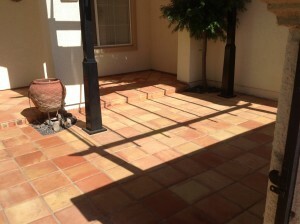 Presealing Saltillo tiles is really important before they are installed. I find most of the time that saltillos are not sealed with enough layers of sealer. 4 coats to pre-seal the saltillo pavers, and then after the saltillos are grouted, they need to be cleaned to remove the grout residue. 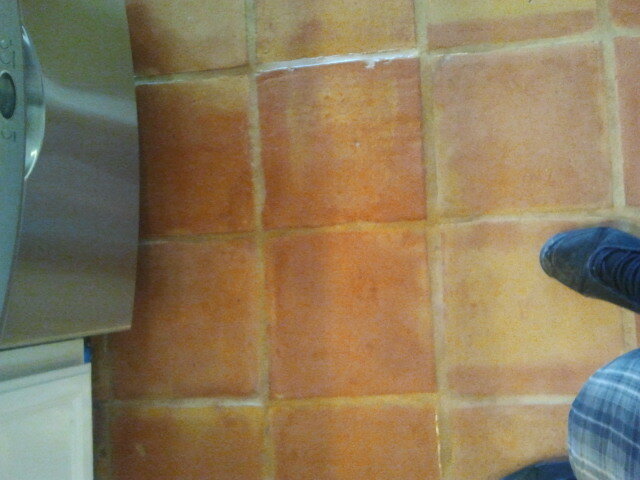 Then the saltillo tile floor needs 3 more layers of sealer on the tiles as well as the grout. 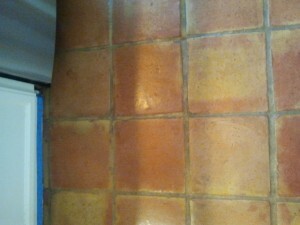 Now you have properly sealed Mexican Saltillo Tile flooring. If the saltillo tiles are cleaned and maintained correctly, you should never need to strip off all the existing sealer with a chemical wax stripper. 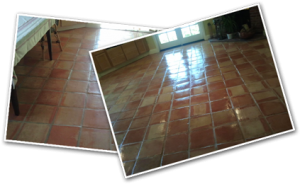 You can clean the saltillo tiles and then apply a couple of layers of liquid floor polish such as mop and glo or some other commercial floor wax to protect the sealer. 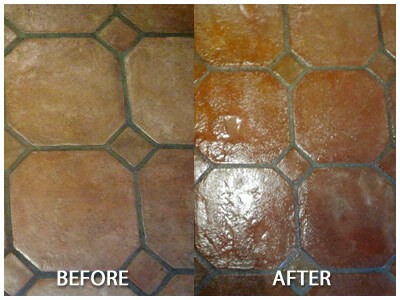 Saltillo tile and Grout, cleaning and maintenance, is a priority with these floors! 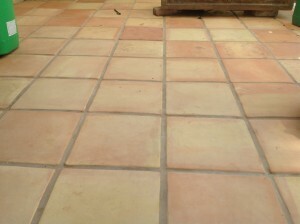 If not maintained correctly, saltillo tiles begin to wear and deteriorate in high traffic areas, really fast. 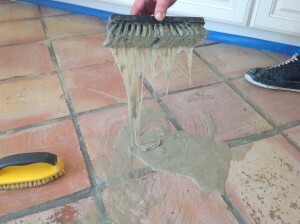 It is imperative that people keep those layers of topical floor sealer or waxes built up on the saltillos as a whole. The object of using the floor finish is to be walking on sealer and not the natural raw clay that the saltillo tiles start off as right out of the box, they really aren’t made to be walked on in this natural state. And your grout can stay cleaner longer if it is also sealed properly. Most jobs I find the Saltillo tile installer pre-sealed the saltillos with 2 coats, grouted the floor, and did not put on the additional sealer that the tiles and grout needed. They don’t even tell the floor owner that the tile floor needs more glossy high shine sealer to finish off the job. On a job like this we detail strip the saltillo tiles on hands and knees using detail brushes and the finest strippers unavailable to most. California tile restoration strips saltillo tiles floors completely off all sealers, waxes, lacquer based sealer, water based sealer, and oil based varnish. Our stripper differs from the competition because it actually strips under the surface of the tile from the inside out. this is old failing sealer, eeeeew. We then detail clean the Saltillo Tiles the exact same way we did our sealer removing process, making sure we get under cabinets, behind toilets, closets, corners, and other places machines just won’t reach. This is what makes the difference between an ok job and our magnificent job giving our customers the HIGHEST QUALITY job with a superior outcome from start to finish. We dry the floor out really well before we apply our final saltillo tile sealing process. We sweep and vacuum very thoroughly. The sealer we use has been a proven winner countless times, and holds up well to traffic, food spillage, scratching, and is slip resistant. Once we apply the proper amount of coats, the saltillo tile floor has a nice even shine throughout the flooring and the grout. We then apply a few proper layers of liquid floor polish to finish off the saltillo tile refinishing and refurbishing process, and at this point your floor is protected from staining and scratching. The Mexican saltillo tiles will look good for years to come. Remember every 3 to 4 years I would have the Saltillo floor tiles cleaned and resealed, keeping the sealer and floor polish built up and bulletproofed. 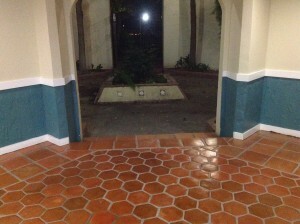 California tile restoration is a saltillo tile restoration and refinishing company servicing Northern California and Southern California in cities and counties including, Marin County, San Francisco County, Black Hawk, Belvedere, Tiburon, Encinitas, Los Angeles County, San Diego County. We refinish Mexican saltillo tiles in Napa, Petaluma, Oakland Hills, Vacaville, Vallejo, Berkeley, Carlsbad, Laguna Hills, Auburn, Placerville, Folsom, Elk Grove, Carmichael, Natomas, Foster City, San Rafael, San Jose, Santa Cruz, Monterey, Bodega Bay, Wine Country, Danville, Lafayette, Los Altos, Saratoga, Yountville, Orinda, Calistoga, Novato, Kentfild, Greenbrae. 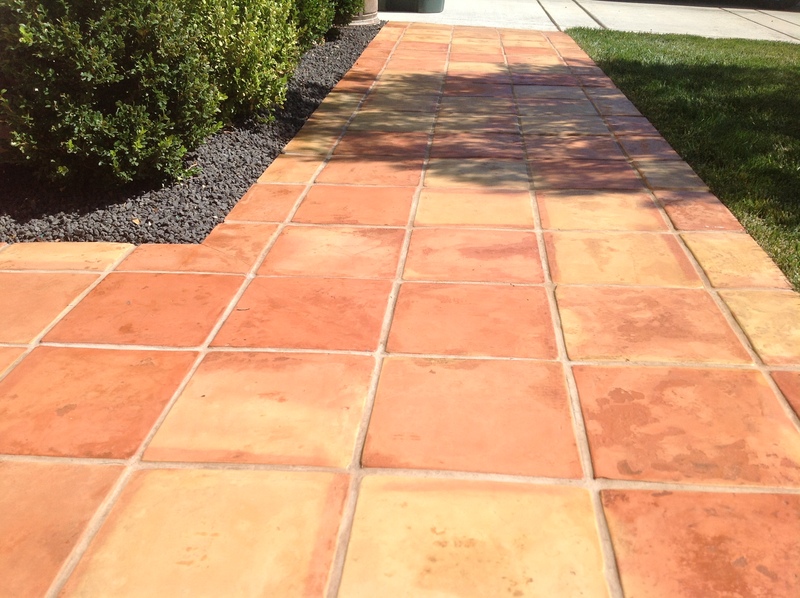 California Tile Contractors and refinishers servicing Lucas Valley, Sausalito, Mill Valley, as well as saltillo tile installations that we have done all over including Corte Madera, Seacliff, Pointe Reyes, Stitson Beach. 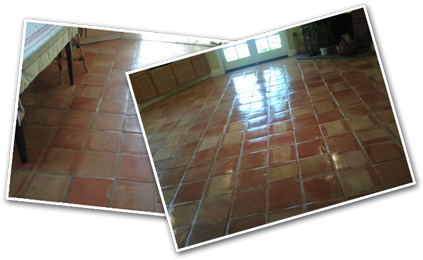 We have restored and stripped saltillo tiles in Palm Springs, Santa Barbara, Stanford, Oceanside Escondido, San Clemente, Rancho Santa Fe, Rancho Bernardo, Sherman Oaks ca and many many more.